Following are the steps we recommend for the best results, fastest recovery, and overall most pleasant experience. 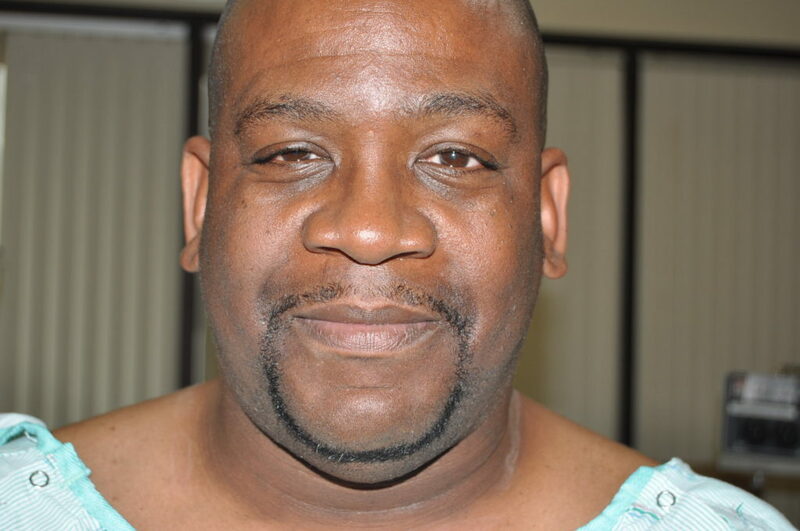 The patient in the photos has consented to the use of his photos online. Immediately before the procedure, the patient is comfortable and confident. He is positioned upright and is fully awake for the procedure. 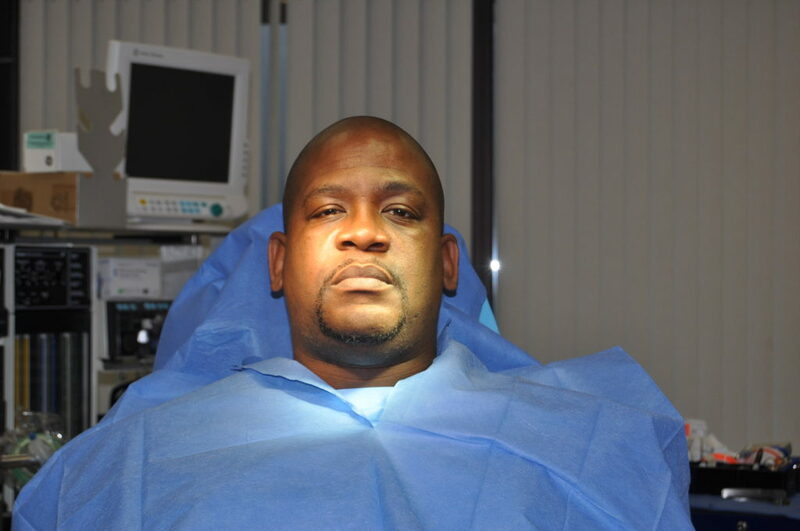 Many patients opt for a general anesthetic (completely asleep); others prefer sedation. Each of these options is reasonable and the final decision of the type of anesthetic is made by the surgeon and patient together, based on the patient’s health and preference. 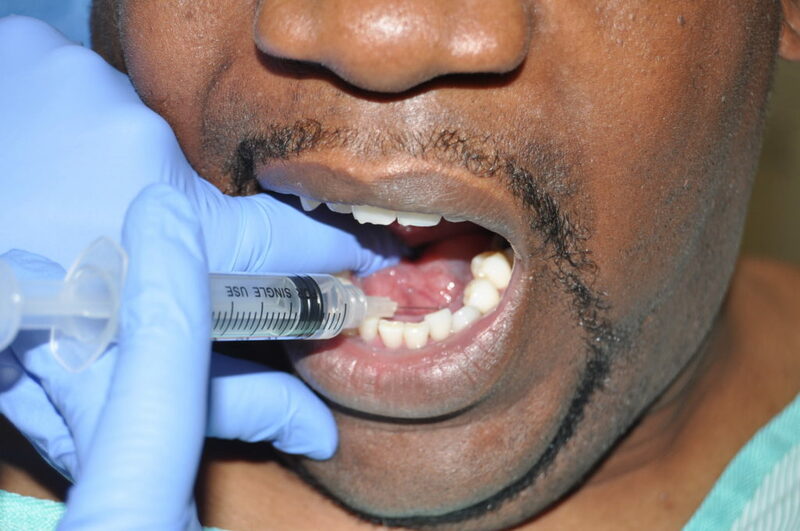 Local anesthesia is injected to block the lingual nerve, which is the nerve that gives sensation to the tongue. Lidocaine is used initially because it provides the fastest onset of numbness. It is combined with bicarbonate, which neutralizes the acidity of the lidocaine so that its infusion does not burn or sting. The injection itself is typically barely felt. 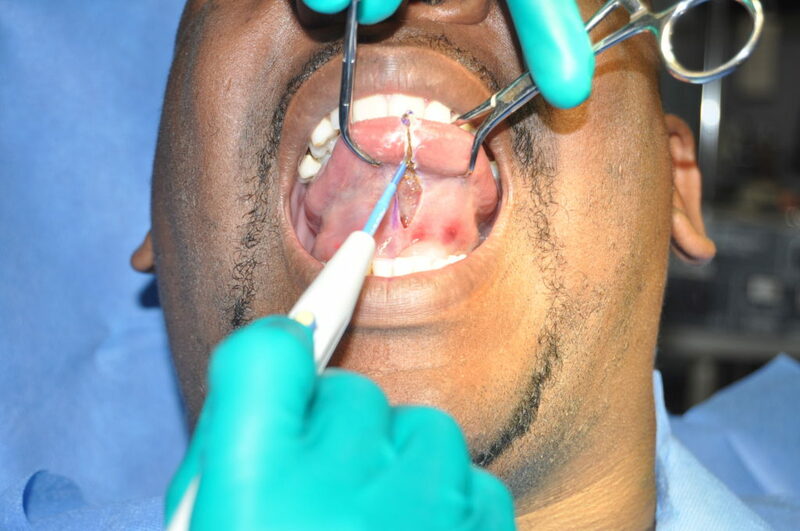 After the lingual block has taken effect, marcaine is injected, and this lasts for several hours and results in overall less overall discomfort long after it has worn off. 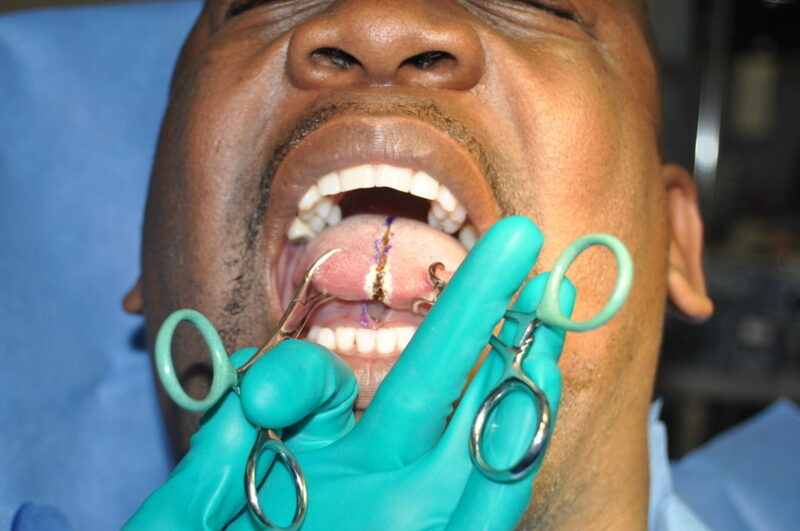 After the tongue is completely numb, clamps are used to secure the tongue. This facilitates positioning and retraction. 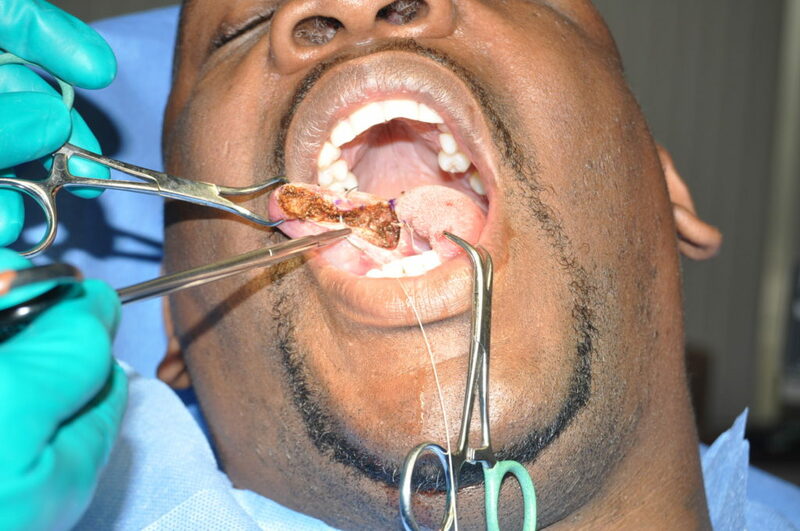 With the clamps in place, additional local anesthetic may be infused directly into the already numb tongue. 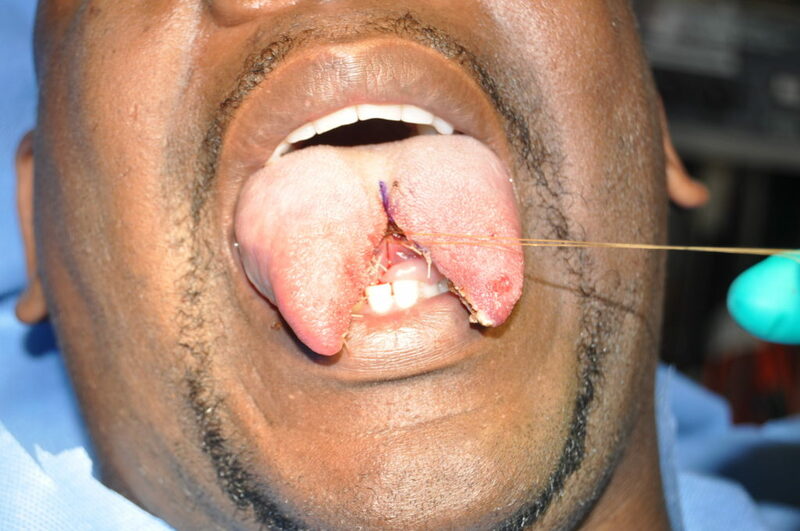 This additional anesthetic results in vasoconstriction of the tongue, which minimizes bleeding and blood loss. It therefore also helps the surgeon’s visualization and best enables the surgeon to stay in the midline. 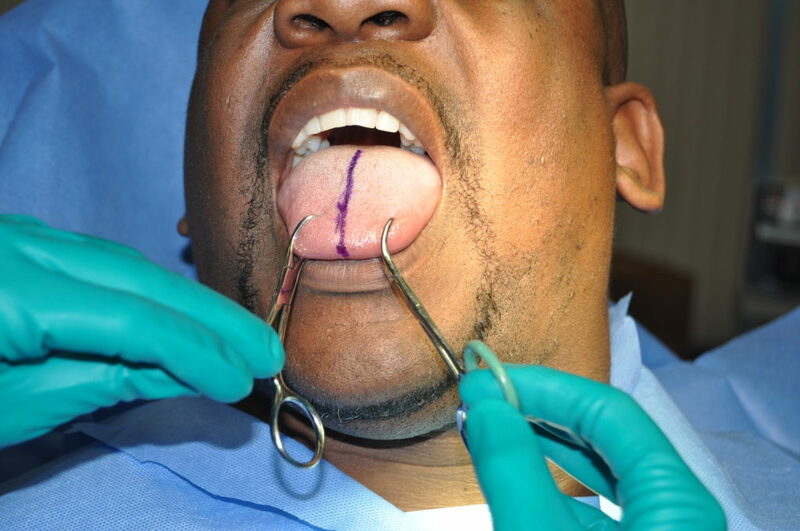 The dorsum of the tongue is then marked with a sterile marking pen. The dorsal aspect of the split typically extends as far back as a midline piercing can be placed. The ventral surface of the tongue is marked with a sterile marking pen down to the frenulum. At least one cm of intact tissue is preserved between the anticipated extent of the ventral split and the submandibular glad ducts. See risks to understand why this is important. The initial incision can be made with a knife (scalpel), but when made with cautery (as shown in the next image), there is little or no bleeding, better visualization, more accuracy for the surgeon staying in the midline, lower incidence of nausea (no blood to swallow), and an overall better experience for the patient. Cautery is being used here to complete the ventral portion of the initial incision. 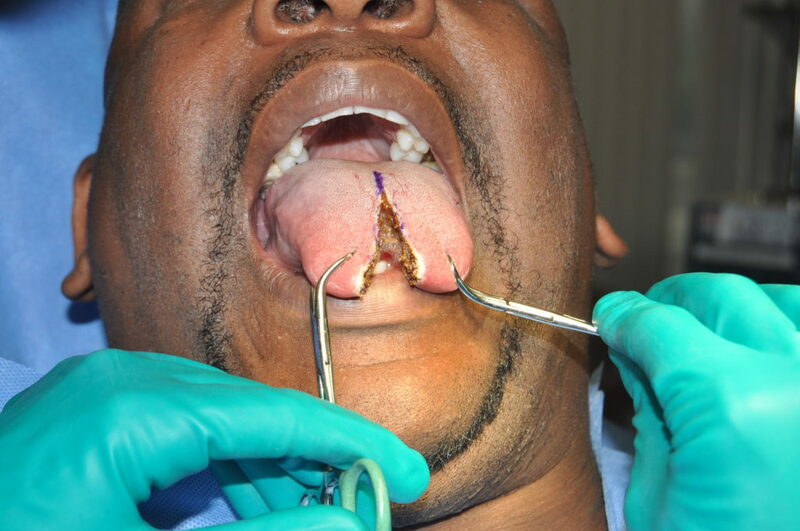 After the initial incision has been made through the mucosa (lining) of the tongue on both the dorsal and ventral surfaces of the tongue, the muscle (genioglossus muscle) is split in the midline, beginning at the tip. The split is extended posteriorly in increments to ensure that the procedure stays in the midline and that any bleeders are controlled (stopped) along the way. The split continues in increments ventrally. The split continues in increments dorsally. 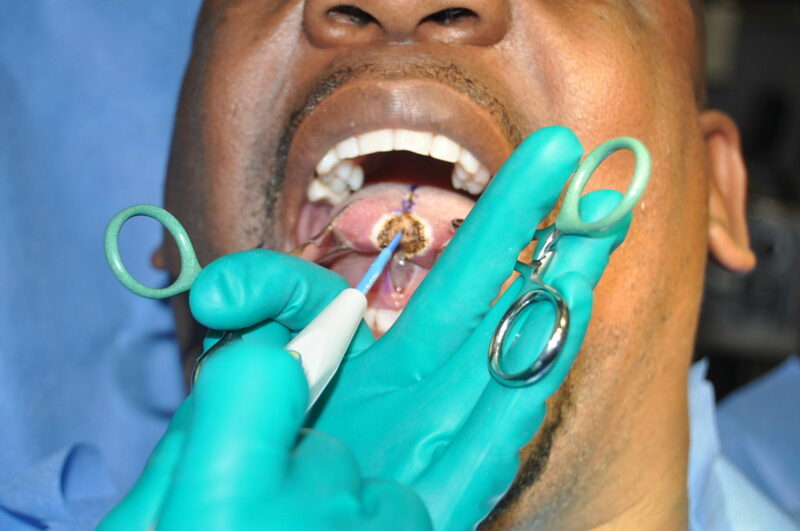 Dorsally, the extent of the split roughly correlates to the maximal posterior point that a midline tongue piercing can be placed. Ventrally, the extent of the split extends to the frenulum and oftentimes into the frenulum. 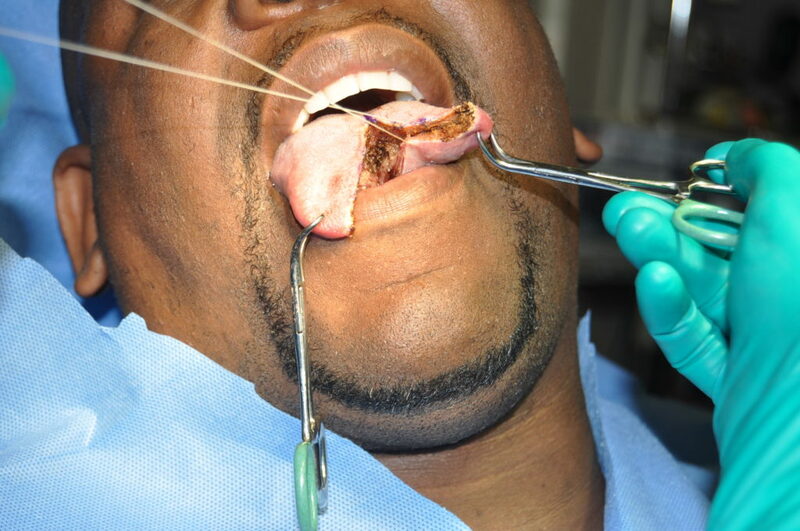 But it stops about a cm away from the duct of the submandibular glands. Going any deeper with the split results in either regrowth back to the point where the split should have stopped (as noted) or results in tethering of the tongue when the dorsum is sewn to the ventral surface at the deepest part of the split. This is because the tongue is just too thick at this point, and trying to preserve the depth of the split by sewing the dorsal and ventral surfaces at this deep point just tethers the tongue down to the floor of the mouth. It is at this point that an experienced surgeon knows to stop splitting and start closing. Closure is important to preserve the split and prevent regrowth. The dorsal and ventral surfaces are closed to one another using a combination of sutures. 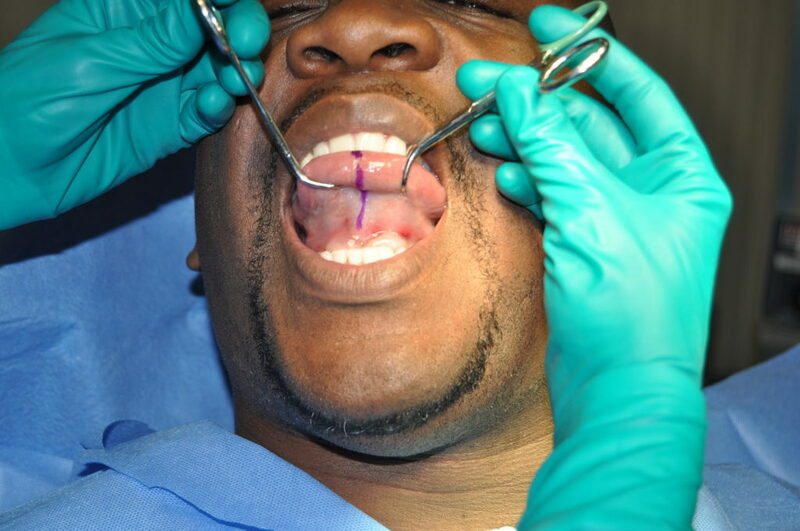 Using a combination of suture types and techniques gives the most reliable closure. 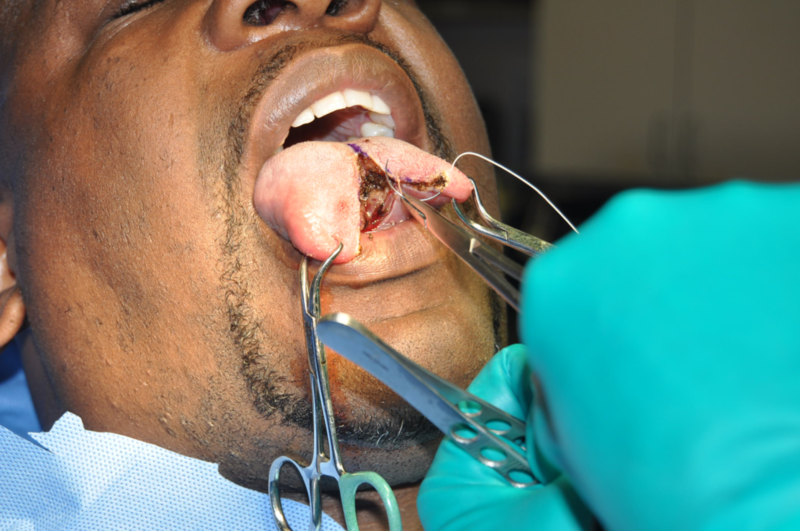 More suturing is shown here. For the best results, the dorsal surface and the ventral surface are coapted with one another, closing off the exposed muscle. More suturing is shown here on the left side of the split. The right side is closed in the same manner, starting in the middle to ensure that the closure is not offset at the tip. The deepest part of the split is left for last. This is where it can be confirmed once again that the maximum depth has been achieved: by placing a trial suture between the dorsum and the ventral surface at the deepest part. 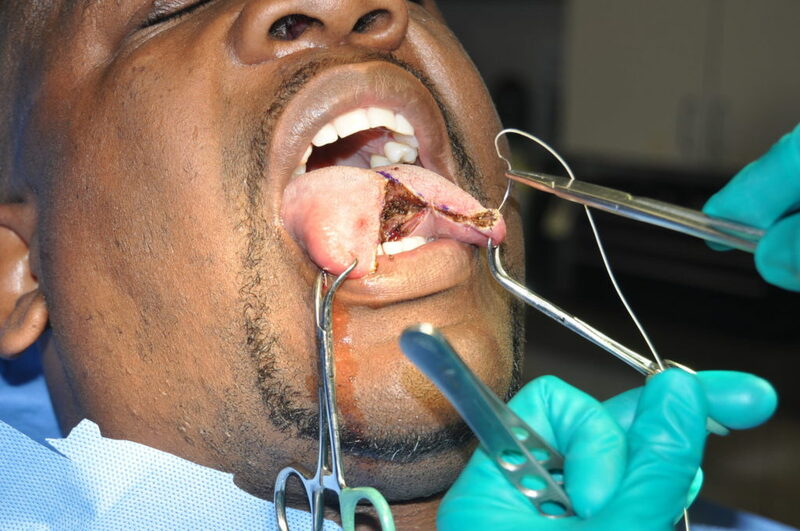 If this does not tether the tongue, the suture can remain. 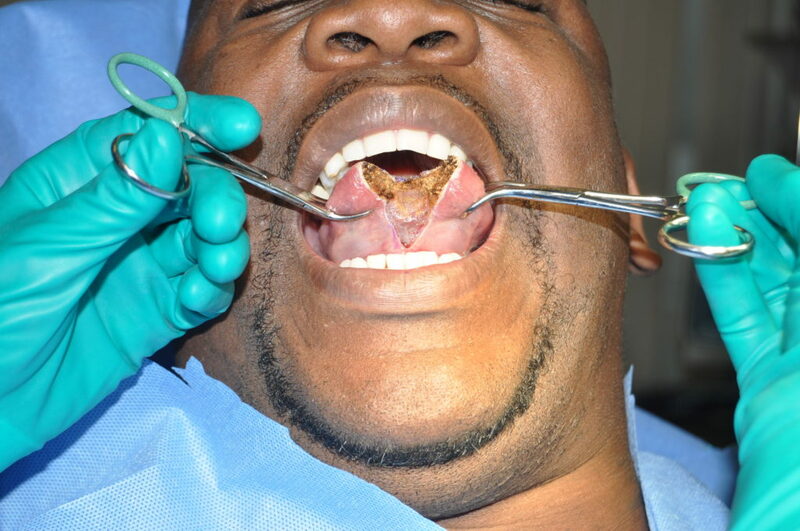 If it does tether the tongue, then it needs to be removed, and the last bit needs to be closed from side to side, rather than top to bottom (dorsal to ventral). The final appearance upon completion of the procedure is somewhat unnatural due to early swelling and the effect of the infusion of the local anesthetic. 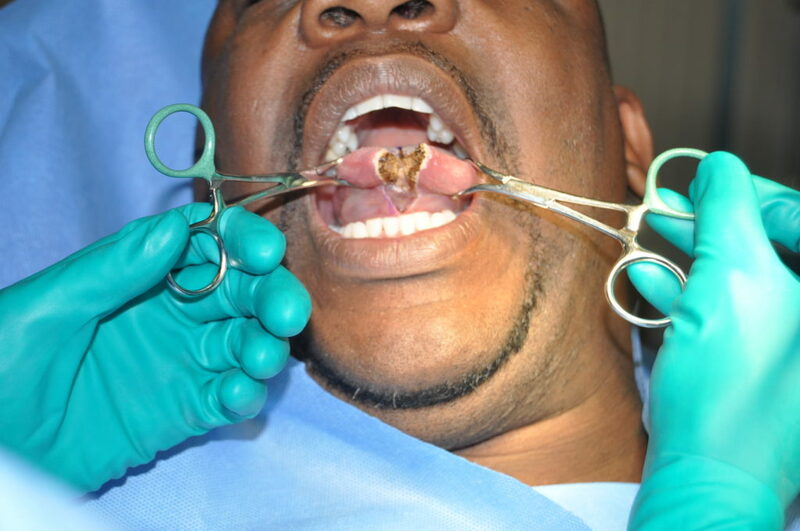 Immediately after the procedure, the patient is comfortable and relaxed.